Perfected Servitors are unique Splicer Servitors that have achieved the rank of "Perfected" in the Archon's Forge Arena. They can only be summoned by inserting a Perfected SIVA Offering into the console right next to the arena. Due to the similarities between the Perfected Servitor and the usual Prime Servitor in size and abilities, it could be that it's a modified Prime itself. 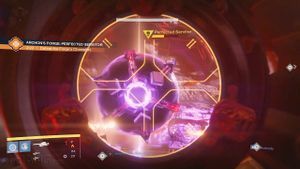 Perfected Servitors are among the toughest champions in the Archon's Forge. They can both tank and inflict more damage than any other champion because they have an extremely high health count and they fire their Void rockets in rapid succession. These rockets even have a unique ricochet property to ensure that players keep their heads ducked down. In addition, they can teleport to avoid incoming attacks, throw off the player's aim, and reposition themselves for a new angle of attack. Even though Perfected Servitors can be deadly from range, it would be a bad idea to get close to them, as they will create a shockwave that will instantly kill the player. However, despite their formidability, Perfected Servitors are slow and cumbersome targets, making them vulnerable to many attacks themselves. They have a fairly large weak point in the center of their body: the eye. It is vulnerable to all sorts of weaponry: scout rifles, sniper rifles, machine guns, and other weapons capable of high, sustained damage. Also, the Iron Battle Axe's heavy attack works wonders as the rapid ticks of damage the line of fire deals can rapidly eat away at their defenses and keep them stunlocked in one place. Perfected Servitors can teleport away from this attack, though, so watch out. When it all comes down to what to use, high-damage weaponry are generally your best bet.